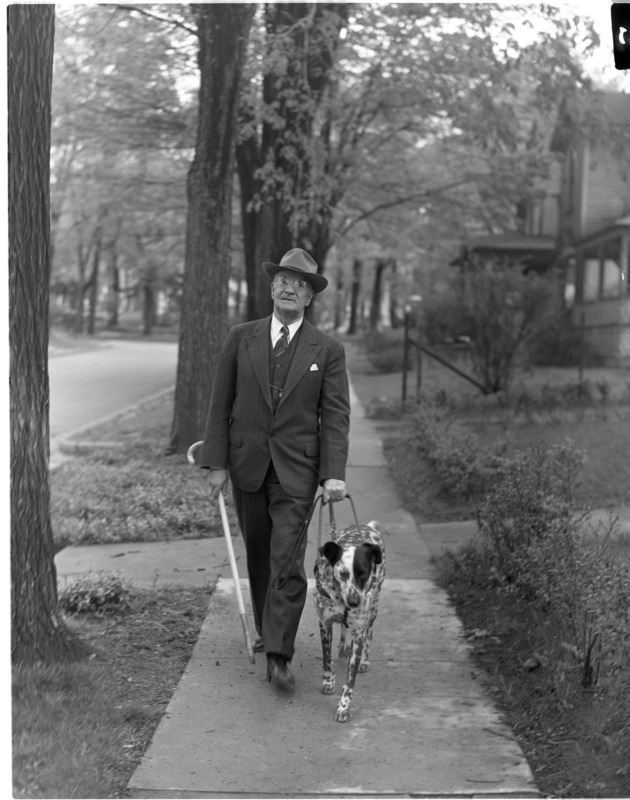 'SPOT' SERVES HIS MASTER WELL: Charles W. Spooner of 513 Elm St., a blind consulting engineer, has been guided for about a year now by "Spot," a Dalmation leader dog obtained through sponsorship of the Ann Arbor Lions Club. To aid blind persons, the Lions Club assists them in obtaining leader dogs and carries on an educational campaign about use of the white cane. Both state and city laws prohibit the use of white canes except by persons wholly or partially blind. The laws also require drivers and pedestrians to stop on approaching or coming into contact with a person carrying a white cane, and to take such precautions before proceeding as are necessary to avoid injury to the person with the white cane. To inform and remind people about these laws, the Lions Club, in co-operation with the city police department, is sponsoring "White Cane Week" this week.